In August of 2017 there is only 1 townhome for sale in VilaBella. This home is listed for $172,500 which is $145.94 per sq. ft. of living area. There is also 1 pending sale currently in Vilabella. The list price was $189,900 which equals $118.17 per sq. ft. of living area. This townhome was on the market for 114 days prior to going under contract. In the past 12 months, 6 townhomes have sold with sales prices ranging from $150,000 up to $190,000 with an average sales price of $168,750 which equals $122.32 per sq. ft. of living area. These sales averaged 36 days on market before going under contract and sold at 97% of list price. These new condominiums located in Stuart are just minutes from it all! Located on Central Parkway connecting the two main roads of Kanner Highway and US-1, VilaBella allows residents easy access to all Stuart has to offer but also keeps residents in a peaceful secluded haven. Modern and pet friendly condominiums feature stainless steel appliances with granite counter tops in the kitchen and in the bathrooms. 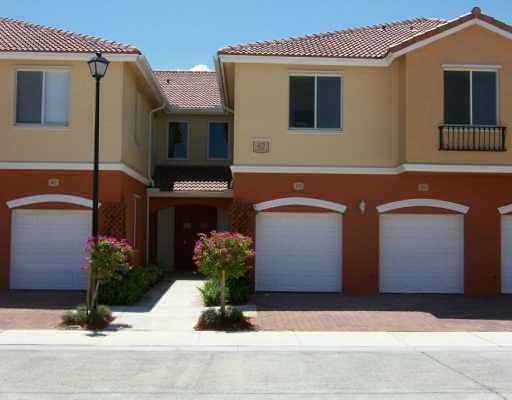 All units have one car garages and terraces with beautiful views of this well landscaped gated community. Hurricane shutters are included with all units. Residents can enjoy a spacious club house with picnic areas and a community swimming pool. VilaBella is close to great schools, downtown Stuart and the gorgeous Stuart beaches!